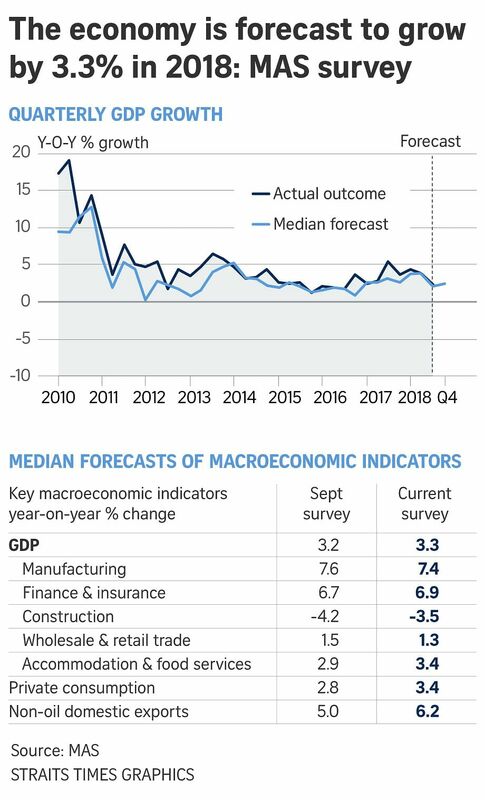 SINGAPORE - While trade tensions between the United States and China could ease, key economists shaved more off their forecast for 2019 economic growth, the latest Monetary Authority of Singapore (MAS) survey shows. A big downside risk is protectionism, they added. For 2018, the economy is expected to grow by 3.3 per cent, a tad above the 3.2 per cent forecast made in September. But growth is tipped to slow to 2.6 per cent in 2019, down from the 2.7 per cent expansion predicted previously, according to the survey findings released on Wednesday (Dec 12). These figures show economists agree with the Government's forecast of between 3 and 3.5 per cent growth for 2018, and slowing to between 1.5 and 3.5 per cent next year. The latest poll show that rising trade protectionism remains a key concern among the 23 economists and analysts polled. All of them, compared to 89 per cent previously, flagged the intensification of the ongoing US-China trade conflict as a downside risk to the Singapore economy. At the same time, more felt there was a bigger chance for trade tensions to thaw, with 47 per cent of respondents seeing this as a potential upside compared to 37 per cent in the September poll. Some also felt that Singapore could benefit from the diversion of trade and investment to the region as a result of the uncertainty over US-China trade relations. The MAS survey, however, was launched on Nov 22 before the US and China agreed on Dec 1 to a 90-day ceasefire to de-escalate trade tensions. The economists also flagged China's economic slowdown and the tightening of global financial conditions - which would lead to higher interest rates - as downside risks to Singapore. But if US Fed rate hikes are slower than expected, Singapore's economy may benefit, some said. For 2018, economists were more upbeat on the finance and insurance sector, projecting it to grow by 6.9 per cent instead of 6.7 per cent as predicted earlier. Similarly, accommodation and food services sector is forecast to show a 3.4 per cent growth compared to 2.9 per cent previously. They also foresee the construction industry to shrink this year at a slower pace: at 3.5 per cent instead of 4.2 per cent as predicted in the earlier poll. But the outlook for manufacturing and the trade sectors is muted. Manufacturing is expected to grow at a slower pace of 7.4 per cent, down from 7.6 per cent, while that for wholesale and retail trade is lowered to 1.3 per cent from September's 1.5 per cent. Households are expected to consume more goods and services, with private consumption projected to grow by 3.4 per cent in 2018. Likewise exports, as the economists predict non-oil domestic exports to grow by 6.2 per cent. Headline inflation is forecast to be at 0.5 per cent for 2018, with MAS core inflation at 1.7 per cent. Both figures are projected to be higher next year: 1.3 per cent for CPI-All Items and 1.8 per cent for core inflation. Economists maintained their forecast of unemployment rate at 2.1 per cent for this year. Looking at 2019, Bank of America Merrill Lynch economist Mohamed Faiz Nagutha sees a challenging year for Singapore, though a crisis is unlikely. "As a small and open economy, Singapore will bear the brunt of any significant global slowdown but strong domestic fundamentals and policy buffers should help better navigate the challenges." "Overall, we hold a relatively optimistic outlook for Singapore, but risks are tilted to the downside," he said in a year-end outlook report.